George Herbert Mead (1863-1931) is a founding figure in the field of sociology. His stature is comparable to that of his contemporaries Emile Durkheim and Max Weber. Mead's contribution was a profound and unique American theory that analyzed society and the individual as social objects. As Mead saw it, both society and the individual emerged from cooperative, democratic processes linking the self, the other, and the community. Mary Jo Deegan, a leading scholar of Mead's work, traces the evolution of his thought , its continuity and change. She is particularly interested in the most controversial period of Mead's work, in which he addressed topics of violence and the nation state. Mead's theory of war, peace, and society emerged out of the historical events of his time, particularly World War I. During this period he went from being a pacifist, along with his contemporaries John Dewey and Jane Addams, to being a strong advocate for war. From 1917-1918 Mead became a leader in voicing the need for war based on his theory of self and society. After the war, he became disillusioned with President Woodrow Wilson, with Americans' failure to support mechanisms for international arbitration, and with the political reasons for American participation in World War I. He returned to a more pacifist and co-operative model of behavior during the 1920s, when he became less political, more abstract, and more withdrawn from public debate. 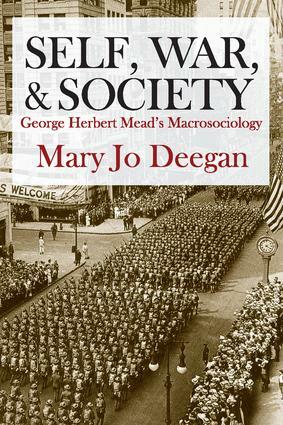 The book includes Deegan's interpretation of Mead's early social thought, his friendship and family networks, the historical context of America at war, and the importance of analysis of violence and the state from Mead's perspective. She also provides illustrative selections from Mead's work, much of which was previously unpublished.